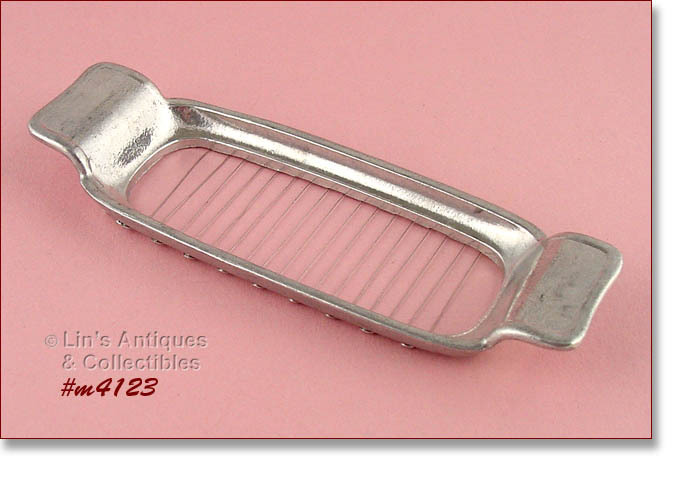 THIS LISTING HAS AN ALUMINUM “SPOON TIDY REST”! IT MEASURES 5 1/8” LONG AND IT’S STAMPED “PLACE ON KITCHEN TABLE OR RANGE, EASY TO CLEAN, UNBREAKABLE, BURN-PROOF, ALUMINUM”. NEAT ITEM, DIFFICULT TO FIND! 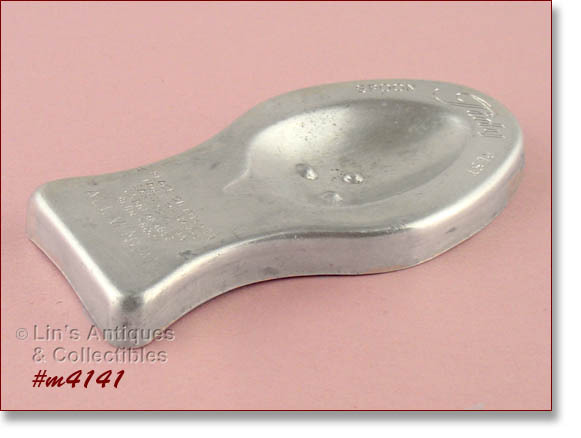 SUPER NEAT ITEM – A “SHORT’NING AND ICE CREAM SPOON”! MEASURES 8” LONG END TO END. SUPER CONDITION BUN WARMER! THIS ONE IS THE MORE DIFFICULT TO FIND STYLE WITH AN ATTACHED HANDLE. BOTTOM IS STAMPED “MIRRO, THE FINEST ALUMINUM, MADE IN USA, 3805M”. WARMER APPEARS TO HAVE BEEN USED VERY LITTLE – IF AT ALL! 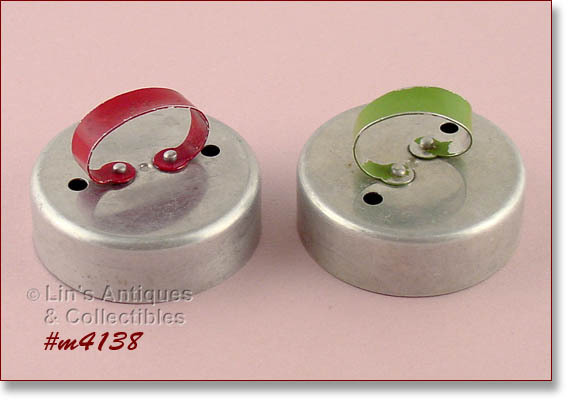 THIS LISTING HAS YOUR CHOICE OF ALUMINUM BISCUIT CUTTERS – RED HANDLE OR GREEN HANDLE! AS OFTEN HAPPENS, THE MIDDLE INSERT IS MISSING SO YOU CAN’T MAKE DOUGHNUTS WITH THESE. CUTTERS ARE IN SUPER CONDITION – THE GREEN PAINT IS WORN IN A COUPLE PLACES – SEE PHOTO. THIS IS ONE OF THE MOST UNUSUAL AND DECORATIVE GLASS COFFEE POTS I’VE SEE – IT’S NEAT! IT HAS ALUMINUM GROUNDS HOLDER/STRAINER AND STEM AND THIS IS ORIGINAL TO THE POT, NOT A REPLACEMENT FOR A GLASS ONE. COFFEEPOT HAS NO MANUFACTURER’S MARKINGS SO I HAVE NO IDEA WHO MADE IT. IT IS IN EXCELLENT CONDITION! THIS LISTING HAS ANOTHER UNUSUAL FIND – AN ALUMINUM ACORN SHAPED TEA STRAINER! IT IS THE LARGER SIZE FOR A POT OF TEA, NOT A CUP. 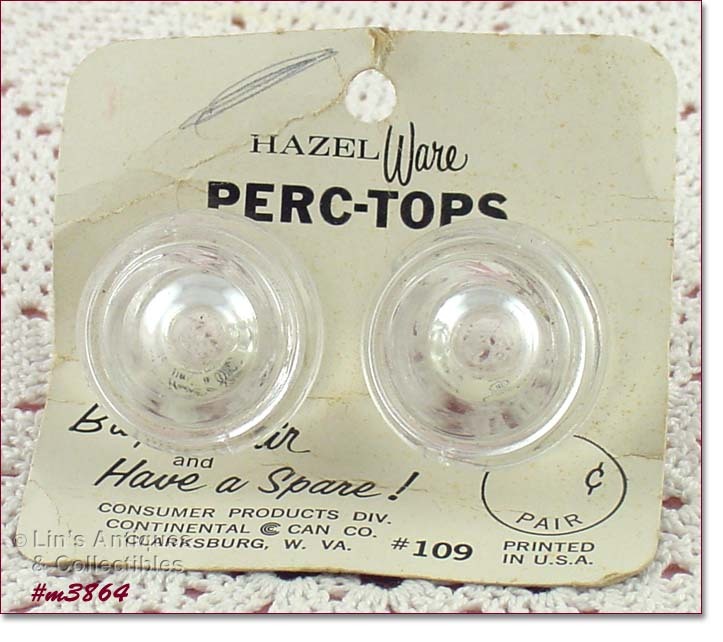 THERE ARE TWO FIZZ-WHIZ BOTTLE CAPS IN THIS LISTING! ONE IS GOLD COLOR, THE OTHER IS BLUE AND BOTH APPEAR NEW AND UNUSED. THIS LISTING HAS ALUMINUM WITH RED HANDLE BISCUIT/DOUGHNUT CUTTER! IT IS COMPLETE WITH THE REMOVABLE INSERT THAT MAKES DOUGHNUT HOLES. THESE CUTTERS ARE BECOMING DIFFICULT TO FIND! MAKE YOUR OWN SLICED BUTTER “PATS” WITH THIS HANDY GADGET FROM THE EARLY 1940’S! IT’S MARKED “PORTIONETTO” AND “GERMANY PAT”. I SAW IN ONE OF THOSE GADGET CATALOGS THAT THIS ITEM IS BEING REPRODUCED DUE TO POPULAR DEMAND/CUSTOMER REQUESTS! THIS ONE IS NOT A REPRODUCTION, IT IS AN ORIGINAL! THIS ALUMINUM COOKIE CUTTER LISTING HAS 12 ASSORTED CUTTERS! THEY ARE ALL IN VERY GOOD CONDITION – THE GINGERBREAD MAN HAS SOME “USE/STORAGE” EVIDENCE – THAT’S IT! WOW – LOOK AT THIS – A COOKIE PASTRY PRESS IN THE ORIGINAL BOX AND THE PRESS STILL HAS THE ORIGINAL LABEL! THERE ARE 3 TIPS, 12 COOKIE PLATES, AND RECIPE BOOKLET. EXCELLENT! 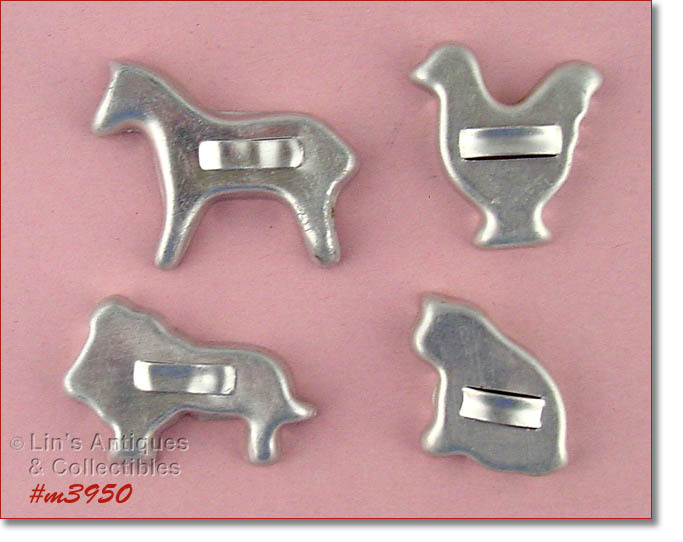 THIS LISTING HAS AN EXCELLENT, NEW CONDITION SET OF COOKIE CUTTERS PRODUCED BY MIRRO ALUMINUM! THERE ARE 17 CUTTERS WITH RECIPE BOOKLET AND THEY WERE IN THE ORIGINAL SHIPPING BOX WHEN I PURCHASED THEM. SUPER! THIS LISTING HAS A DIFFICULT TO FIND DRIP-O-LATOR MADE BY REVERE WARE! ALL PARTS ARE PRESENT AND ITEM IS IN VERY GOOD CONDITION WITH SOME EVIDENCE OF “USE”. THERE IS SOME WATER STAINING IN BOTTOM AND EXTERIOR BOTTOM HAS SOME DARKENED AREAS (MY GUESS WOULD BE CAUSED BY USING ON A GAS FLAME BUT THAT IS ONLY A GUESS). I SCRUBBED ON THE DARK AREAS AND IT CLEANED UP SOMEWHAT BUT NOT COMPLETELY SO I DON’T KNOW IF IT WILL REMOVE COMPLETELY. 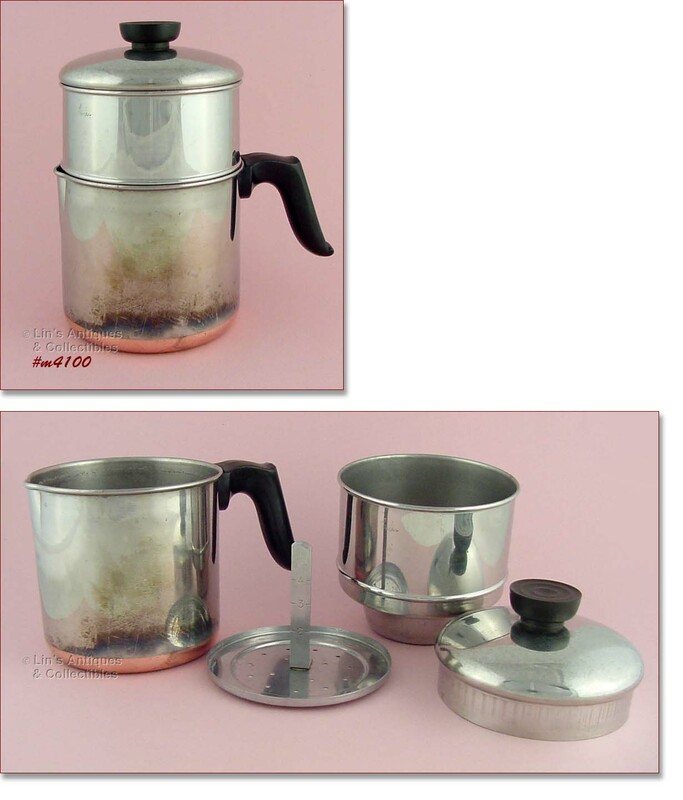 THIS IS STILL A NICE COFFEE MAKER THAT IS NOT YOUR EVERYDAY FIND! THIS WOULD BE AN EXCELLENT GIFT FOR THE TEA CONNOISSEUR IN YOUR LIFE (OR FOR YOURSELF)! IT’S A TEA POT SHAPED TEA INFUSER AND IT HAS A LITTLE TRAY TO PUT IT AFTER YOU’VE STEEPED YOUR CUP OF TEA. PER BOX, THIS IS “THE MI-TEA INFUSER”, MADE IN ENGLAND. NEAT ITEM! EXCELLENT CONDITION LONGABERGER BASKET! BOTTOM IS STAMPED: LONGABERGER BASKETS, HANDWOVEN, DRESDEN, OHIO, USA. ALSO STAMPED “AMERICAN CANCER SOCIETY” WITH HANDWRITTEN: CSH, 1999. 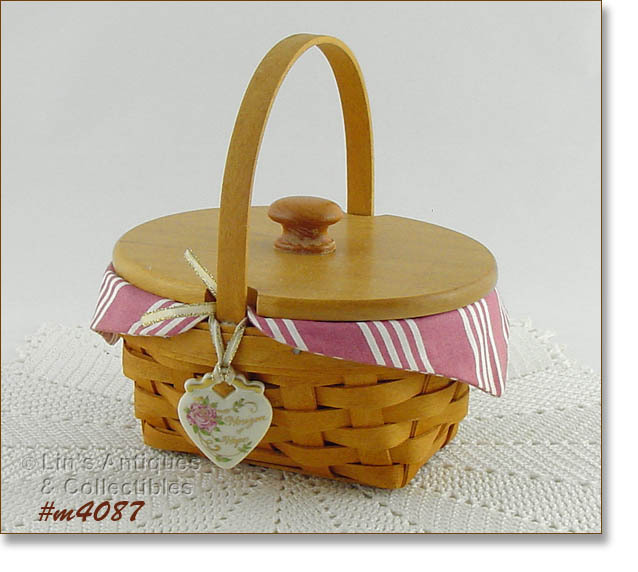 LITTLE BASKET IS ABSOLUTELY ADORABLE! SUPER CONDITION LAUNDRY SPRINKLER! 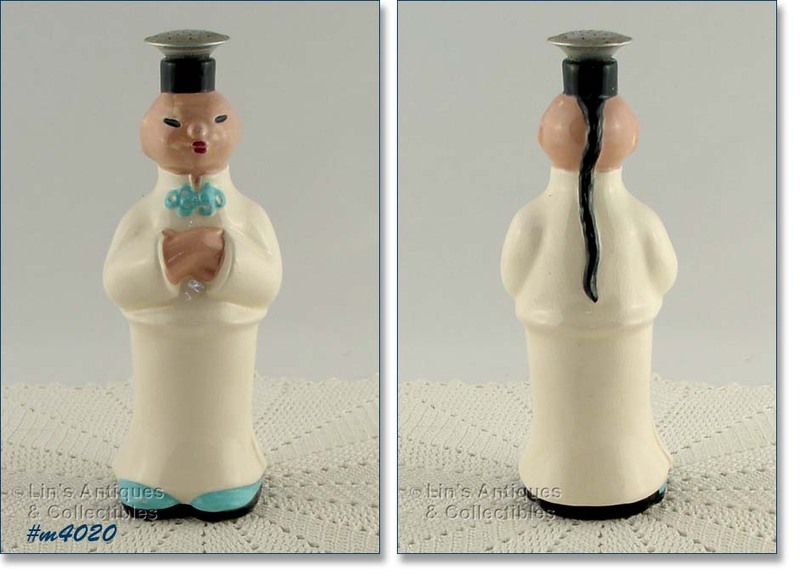 THIS ONE IS “SPRINKLE PLENTY” CHINAMAN LAUNDRY SPRINKLER AND WAS MADE BY CARDINAL CHINA COMPANY. SPRINKLER HAS NO DINGS OR CHIPS OR CRACKS BUT DOES HAVE SOME CRAZING (VERY COMMON WITH THIS SHINY OVER-GLAZE). EXCELLENT ITEM! I LOVE THESE OLD LAUNDRY SPRINKLERS AND BUY THEM WHENEVER I FIND THEM! THIS ONE IS MADE BY CLEMINSON’S POTTERY AND MEASURES APPROXIMATELY 7 ¾” TALL (NOT INCLUDING SPRINKLER TOP). HE IS IN VERY GOOD CONDITION WITH SOME PRODUCTION COLOR MISSES ON HIS FACE. THE ONLY “USE” EVIDENCE IS MINOR – A 1/8” GLAZE/COLOR DING IN THE BLUE COLOR ON HIS RIGHT FOOT AND A 1/16” GLAZE/COLOR DING ON HIS RIGHT EAR. SPRINKLER HAS SOME GLAZE CRAZING WHICH IS VERY COMMON. THIS IS A SUPER ITEM AND IS PRICED TO REFLECT MINOR IMPERFECTIONS! 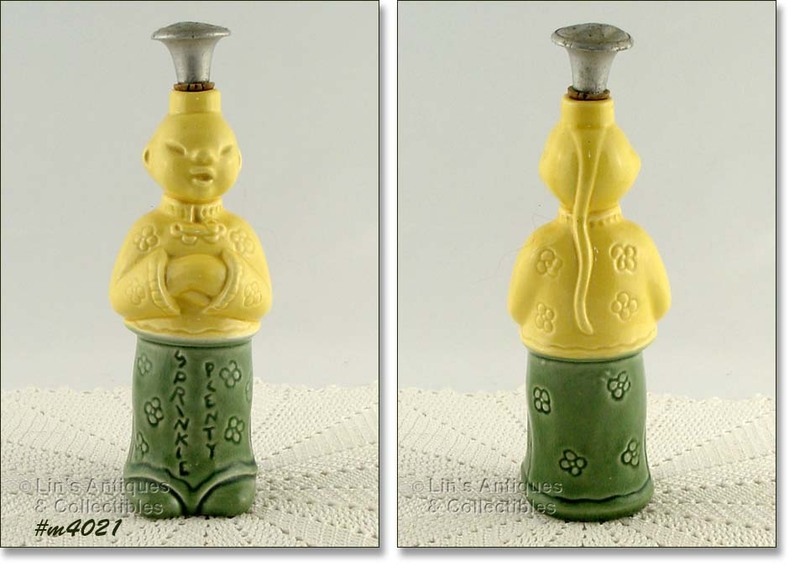 THIS LISTING HAS A LAUNDRY SPRINKLER MADE BY CARDINAL CHINA COMPANY! THIS IS “SPRINKLE PLENTY”, MEASURES 8” TALL (TO RIM), AND HAS WHAT APPEARS TO BE THE ORIGINAL SPRINKLER TOP. LAUNDRY SPRINKLER IS IN EXCELLENT CONDITION – NO CHIPS, NO CRACKS. IT HAS SOME CRAZING THAT IS NORMAL WITH THIS CLEAR OVER-GLAZE. VERY NICE COLLECTIBLE AND A VERY USABLE ITEM! 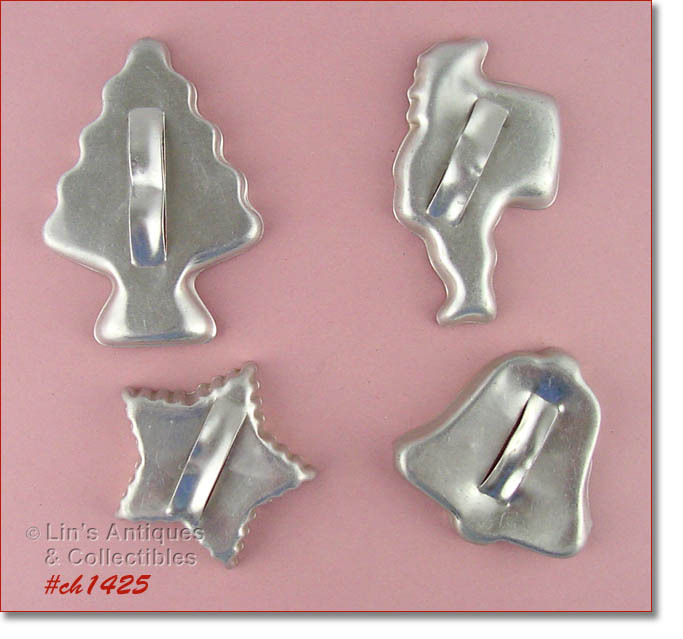 THIS LISTING HAS 4 MINIATURE COOKIE CUTTERS! THERE’S A HORSE, A LION, A CAT, AND A CHICKEN. COOKIE CUTTERS MEASURE 1 3/8” X 1 ¾”. CUTE ITEMS. THIS LISTING HAS 4 ALUMINUM COOKIE CUTTERS! THERE’S A BELL, A TREE, A SANTA, AND A STAR. NEAT! THIS LISTING HAS 8 ALUMINUM COOKIE CUTTERS! THERE IS AN ANGEL, A SNOWMAN, A GINGERBREAD MAN, A BELL, A TREE, A REINDEER, A SANTA, AND A HOLLY LEAF. NEAT ITEMS! I LOVE VINTAGE LAUNDRY SPRINKLERS AND BUY THEM WHENEVER I CAN! 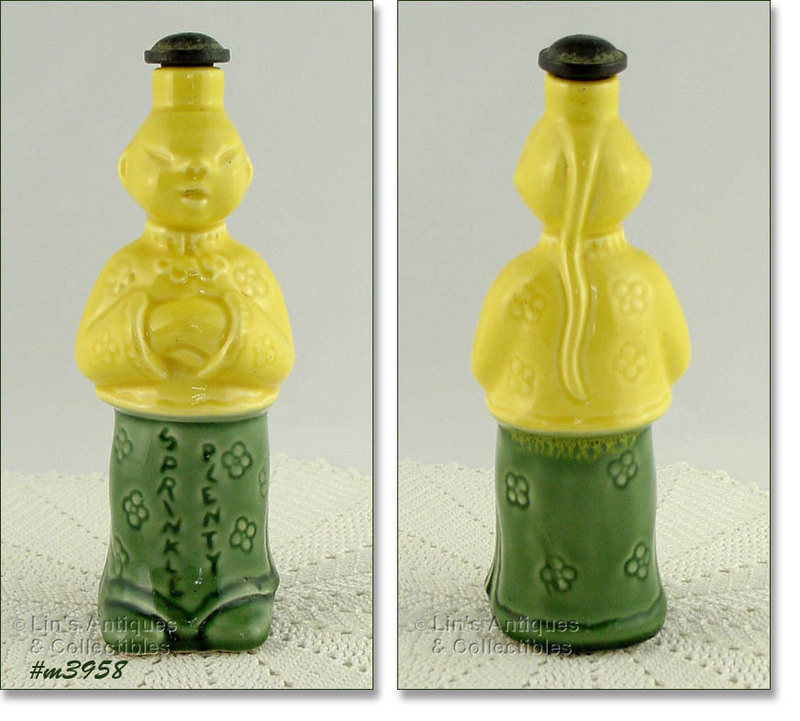 THIS ONE IS A CLEMINSON POTTERY PRODUCTION, MEASURES 8” TALL, AND IS IN SUPER CONDITION. HE HAS NO CHIPS, NO CRACKS – DOES HAVE PRETTY OVERALL CRAZING – THAT’S IT! A SUPER COLLECTIBLE!